During his five tours of duty with the United Nations Interim Force in Lebanon (UNIFIL), Martin Malone has seen the best and the worst of mankind: from children patrolling the streets of Beirut with guns and grenade launchers, to young soldiers valiantly sacrificing their lives to save their comrades. Martin is one of the thousands of Irish troops who passed through one of the world’s bloodiest conflict zones between the 1970s and the present. Many never made it back. The Irish troops in Lebanon were initially intended to supervise the withdrawal of Israeli soldiers after the first invasion in 1978. But, a second invasion in the 1980s unleashed prolonged guerrilla warfare between Israeli forces and Hezbollah that has lasted to this day. The Irish Battalion was caught in the middle of this conflict; in all 47 were killed and many more injured. 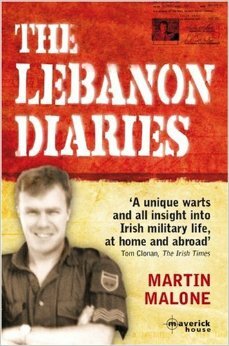 Drawing on his personal diaries and letters, Malone gives a unique and revealing insight into the life of an ordinary Irish soldier. He writes about the trauma of leaving his wife and children behind, the boredom of The Curragh Camp and the unspeakable horror he witnessed in a land that has never known peace. The Lebanon Diaries is a must-read for any person interested in the ongoing conflict in Lebanon.